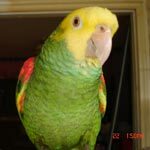 I'm asking help because I don't know how to change my parrot's behavior for his own good. He's four months old. When I open his cage, he goes out by himself (or rushes to my hand to get out) and gets on top of it, where he has food, water, trees to climb and toys to play with. I try to change the toys often so he can entertain himself but he is very dependent, it seems he won't play if there is not someone near him. He is very dependent, all he cares about is attention and being petted. But, life being what it is, I can't spend every minute with him. So, everytime we move out of his sight, he " flies " in an attempt to follow us. But, his wings being cut so short, he just drops on the floor. Here's my question. I would really like him to be out of his cage everytime we're home, even if we're not sitting in front of him, so how do I teach him to stay on his cage ? Right now, I just put him back on top of his cage when he drops on the floor, without giving him any attention, because I don't want him to associate dropping on the floor with attention. After 2 or 3 times in a row, I put him back inside his cage. I've been doing this since I had him 6 weeks ago, and he clearly does not make the association " if I stay on my cage, I'll get to stay out " - if I don't, I'll go back to my cage. Let him drop to the floor. Just walk away and leave him there a while. He'll get bored on the floor and will be thrilled to return to the cage top by comparison. Personally I wouldn't prefer to use the cage top as the parrot's play area. I like to have a tree or perch near where I am so we can see each other and to avoid cage aggression. Wow, so simple, I never thought of that. I'll try it, thanks Michael ! As for cage aggression, I lived it before with my Quaker, so I know what it's all about, but this little one is just a sucker for affection, so every chance he gets to be in contact with a hand, shoulder, face or any part of you he'll take ! I've never seen a parrot or any bird be so affectionnate. He's my first Brown Headed Parrot, so I have no idea if they are all like that, if this is just a phase because he is so young, ect. But cage aggression is not part of his vocabulary right now ! Yeah, he's a sweet little baby. Don't take it for granted and practice maintaining it from early on so you don't lose it. I don't like my parrots spending TOO much time in their cage or they do get a bit more aggressive about it. They are definitely much more tame away from the cage although I have no problem reaching in and grabbing them out. But other people can get bit if they reach in. Yeah, you're right. I do expect some behavior changes as he matures. If he were to behave right, ie not drop on the floor all the time, he'd be out of his cage all the time. I don't like caged birds too much. We have time, though, he's still young. I need more suggestions please ! Michael, your idea seemed to work at firts, but he doesn't seem to care after a while. He just goes on the floor and walks around. I can't watch him on the floor all days, and I don't want to leave him in his cage all the time either. What to do ? Poor baby needs more time out of his cage ! I've added some sisal rope ladders and walks to it, it's hung with a few toys that get changed up, and he's happy as can be clambouring around on it while we're busy doing things elsewhere in the room. It has wheels, so it can be moved between rooms to keep him close. We move it between the kitchen and living room; if I have to go put away laundry in the bedroom, for example, I just take him with me and let him play on the dresser. It works pretty well for us, and is a nice alternative to a cage top play area! I really don't know what to do. I guess I'll just let time do its work. I try teaching him to stay put, but don't have much luck. He is testing his wings. Myrtle came to me clipped. She was kept in a small cage that was only big enough to stand on her perch. I gave her a big cage with a play patio on top and never closed her door. Every once in a while she would test her wings and splat on the floor. Even though she would not allow me to touch her, she would find me and climb up to my shoulder so I could walk her back to her play patio. I have learned so much on this forum. I was really ignorant of birds when I got Myrtle. (Rainbow was not a bird. She is a feathered kid.) When I got near Myrtle she would put her foot up. I would say "tickle tickle" and tickle the bottom of her foot with one finger. I did not know that meant to back off. It was the first touch she allowed. Did you parrot proof the room he is in? If you did you don't need to non stop watch him. Give him foot toys that make noise and a cardboard box to tare up. After he investigates his room he will play with the toys, kick them around, tare them up or attack them for entertainment. If he does not have flight feathers he needs to exercise his muscles. He can walk around and flap until he gets them. That crashing to the floor is him testing his wings. He will get tired and hungry and want to go back. Don't close the door right away when you put him back so put him back does not seem to mean close him up. You can give him a treat so he believes he has to be closed to get his treat. Before I had a whole flock in a room, when I would get a cockatiel, no matter if he was tame or scared, I would let him fly until he got tired. My first touch was to help him up off the floor and back to what is familiar (his cage).